Chip Container Hinged Bottom SBTCKB1300L | SalesBridges B.V.
Chip Container Hinged Bottom SBTCKB1300L. Suitable for forklift and crane. SBTCKB is a highly valued Hinged Bottom Container, due to its durability. Small industrial vehicles are flexible, maneuverable and can also be equipped with various additional forklift attachments to perform different tasks. This container can be used for, for example, metal, glass, wood, debris. Collecting, storing and transporting with the SBTCKB is possible. The Hinged Bottom Skip is also very suitable for use on construction sites, because multiple containers can be stacked on each other and transported by truck or crane. Space-saving storage and easily transported. The Tippling Container SBTCKB has a large number of positive features in its functionality. The suspension of the bottom is assisted by tensile springs during emptying. The hinged bottom opens to other side of the forklift, so that emptying can take place without impact on the forklift. Equipped with a safe and stable unlocking mechanism, which can be operated by a pull cord from the driver's seat of a forklift. 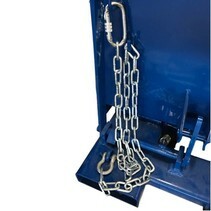 For additional safety, a safety chain can be attached on the forklift. Add a security chain and cable set to your order. Thanks to the use of high-quality steel sheets and excellent finishing, the bottom skip containers are very durable and robust. Finishing with powder coating in standard color RAL5010. Custom work is possible upon request. Also available in other RAL colors upon request. For B2B, please email to sales@salesbridges.nl.